At Premiere #1 Limousine, we understand that a Quinceañera is a special celebration of womanhood that is as important to your Latino culture as it is for your daughter. Whatever you need, we are here to help and accommodate. 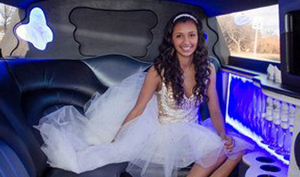 Make an appointment to pick out a limousine for your Quinceañera. Our friendly staff is here to answer all your questions. Let us help treat your beautiful birthday girl like a queen! Choose from one of our super stretch limousines in black or white, our Pink Expedition or create a Cinderella Quinceañera in our Hummer H2 limousine or Trolley. Our uniformed chauffeur will greet you at the door on time, with a spotless limousine out front and superior amenities inside the vehicle. Step in, let our chauffeur get the door, and be the center of attention for your special Quinceañera. A Quinceañera is a once-in-a-lifetime opportunity to celebrate someone incredibly special in your life. Make sure the event goes as smoothly as possible when you choose a limousine service for your Quinceañera. A limousine service ensures the transportation from the church or reception is taken care of without you needing to worry about traffic, parking or anything else that might come up unexpectedly. You get to focus on the young lady being celebrated, which is exactly where your focus should be. A Quinceañera is important enough that many people travel from miles away to be a part of the big day. When you choose to rent a limo for a Quinceañera, that limousine can be used to pick up guests at the airport or to help guests from out of town navigate from one location to another without getting lost. Using a limousine service for a Quinceañera also delivers the message to all involved that this moment is incredibly special and important, and that it’s being celebrated appropriately. Make sure the Quinceañera you’re planning is one that no one will soon forget when you choose to rent a limousine. Between gifts and decorations and people, there’s a lot of stuff to transport from one place to another during a Quinceañera. When you choose to rent a limo for a Quinceañera, you have all the space you need to move things from one venue to another while maintaining plenty of space for the people who also need to get from place to place. An event can get bogged down by trying to cram as much stuff as possible into the trunk of a car or into the back of a truck. Our drivers and vehicles are at your service during the event, so take advantage of all the available items. Our customers become royalty after they choose Premiere #1 Limousine Service. We often serve families celebrating a Quinceañera or an anniversary, and we also serve bachelor and bachelorette parties and other groups. No matter the occasion or what you’re celebrating, a limousine service can take that celebration to the next level. We make sure you have the safe, reliable, clean and luxurious transportation you need — service that transforms a special event into the event that you’ll never forget. We have many vehicles to choose from, and it’s simple to identify and reserve your best option — all while enjoying an attractive price. For a complimentary quote on service, get in touch via email, phone or online. You’ll find it’s incredibly easy and affordable to secure limousine service for a Quinceañera and to make the important event as special as it possibly can be.